but what they grow to be. We need more Luna Lovegoods and Hermione Grangers in a world full of Pansy Parkinsons. Well, this is not a review of the book itself, but a few of the life lessons I got from the Potter series. I love that quote because (1) I'm a Potterhead, and (2) because if you know Luna Lovegood, Hermione Granger and Pansy Parkinson, you would agree. Luna Lovegood is one of the characters in Harry Potter that you will learn to love. She is weird, she was called Loony Lovegood because she's odd and she doesn't fit. Pansy Parkinson is your typical mean girl at school. She's not pretty inside and out. She sticks with people who thinks they're powerful and bully everyone. She talks trash about you and makes your life miserable. She's your worst nightmare. Hermione Granger is just as famous as Ron Weasley and Harry Potter. She's one of the popular trio in Hogwarts. So, I'll presume you know who she is. Luna Lovegood speaks her mind even if it means being the laughing stock of the school. She believes in what most people in her world think is baloney. She can make you uncomfortable because she points out the truth that no one else would dare. Pansy Parkinson may have a field day every time she say something foolish but she doesn't care. How many of us can freely say what we want to say like Luna? Hermione Granger is the smartest witch of her age. Yet despite being number one in her class, she doesn't brag about it. Pansy Parkinson is not even half as smart she is but loves to call attention to herself. And she always say bad things about Hermione. In our world, those who are pulling you down are already below you. They're not half as successful as you are and since they can't beat you, they will try to discredit you instead. Sometimes people in your life will try to expose what's wrong with you because they can't handle what's right about you. 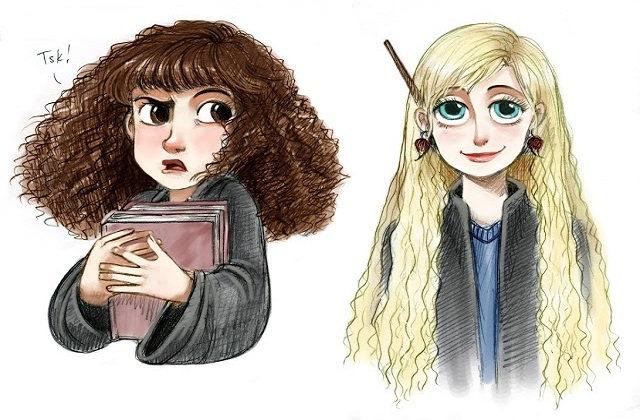 Luna Lovegood and Hermione Granger define their own standards. Luna has weird fashion sense that even Harry was quite embarrassed when he was with him because he was conscious of people laughing at Luna openly. But Luna doesn't give a damn about what people say. She's comfortable with who she is and goes for what she believes is beautiful that no critic can tell her otherwise. Hermione Granger is looked down for being a Muggle born (witch born from non magical parents). In our world, she is the favorite subject of bullying and racism. The name calling and the discrimination though didn't stop her from being the top of her class. Both girls were victims of harassment, verbal abuse and torment, but neither backed down or got intimidated. Neither stooped down to their critics' level. Luna Lovegood and Hermione Granger fought with Harry up to the very end. Especially Hermione. She saw everything that Harry went through and she stayed with him loyally. Both Luna and Hermione are your ideal best friends---with unquestioning loyalty and who are willing to give up what they have and risk everything to fight with you and for you up to the very end. Luna and Hermione were brave enough to not go with the crowd. When everyone else were taking the easy way out by going with the majority, they were not swayed. They have independent minds. And I think it's beautiful that it so happened they found like-minded people. They value friendship. One of the many things I love about Harry Potter series is the way they all value one another despite being different. They all have uniqueness and quirks but when it comes to friendship, they all jive. Today, you'll seldom find people who are genuine and sincere. Sometimes you have to think hard and long before you'll know what the other person's motive is. Sincerity is a big issue. So when you find people who are real, it becomes a rare opportunity. Although both Hermione and Luna are victims of bullying themselves, they don't sit around and watch the likes of Pansy Parkinson bully others. They may sometimes stay quiet and ignore the name callings in the halls, but they do stand up for those who are being bullied. They protect other people as much as they can. They both tried to stop the most powerful and evil wizard of all. While Pansy Parkinson would have followed and caved in to Voldemort's threats, they were both willing to sacrifice their youth, and put their lives on the line, fighting side by side with their friends who are just as young and vulnerable as they are. They're both selfless. Careless and brave yes, but selfless nonetheless. Harry and Ron would have been lost without Hermione. She was the brain in their group. She thinks in advance and she thinks...well like a woman does. That saved them from a lot of trouble in their journey. Luna was the one who talked Harry back into his senses when he tried to isolate himself from the crowd. If it wasn't for Luna's carefree insight, Harry would have ruined his friendships and he would have been more vulnerable to Voldemort. She was also the one who was there when Harry felt alone. Men then, couldn't have done so much or survived without them. Both Luna and Hermione embody Girl Power. They are both fighters. They are both very smart and wise for their age. They are both looked down by the self-righteous and the fault-finders. But, they both remained confident, staunch and unwavering that no Pansy Parkinson can put them down or stop them. Photos and gifs from Google images. The book is so much better in my opinion so if you have the time, I encourage you to read it. But, the movie isn't that bad. Especially the last installments. Absolutely! They are my two favorite characters in this series because they are so strong and smart. I'm doing pretty good today, thanks for asking. This is such a clever post! I agree entirely. We can't have too many Hermiones and Lunas running around. I love this post! How fun to link feminism to your favorite book series! Ah, the Potter series are some of my favorite books. Can't wait until my daughter is old enough for them - she's going to love them. So many good points here about these characters. I loved them both. It's good for girls to have strong and positive character models in literature, film, etc Great post! Here via Literacy Musing Mondays - so glad I stopped by!